In order to provide the most convenient and comprehensive training experience possible, GPSTC offers on-site lodging in our 253-room dormitory. We offer both standard and premium room options on a first-come, first-served basis. Dorm check-in will begin at 2:00 p.m. on Sundays. Students must check out no later than 8:00 a.m. on the day of departure. Students must vacate/move out of their dorm room and return the room key to the Student Services desk by 8:00 a.m. on the last day of class. A $10.00 fee will be charged for late check-outs. 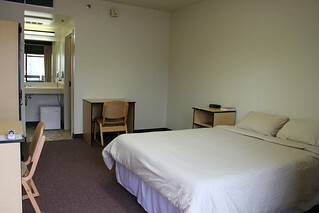 The use of the GPSTC dormitories is for students and eligible instructors only. No spouses or guests are permitted, unless they are also actively attending a GPSTC event. All forms of alcoholic beverages and illegal drugs are prohibited on state property except for use in training activities under the direct supervision of a Course Coordinator. All forms of gambling are prohibited on state property. Smoking (including the use of vapor e-cigarettes) is permitted in designated areas outside the building. Tobacco chewing, dipping and spitting is regarded as an outdoor activity. GPSTC’s standard dorm rooms provide a convenient and cost-effective lodging option that allows students to focus on their training objectives. Each standard room is double or triple occupancy and features a bathroom and a television. Students may choose to lodge as a single occupant in a standard room on a space available basis for a fee. Our premium rooms are single occupancy and boast a queen-size, hotel-quality memory foam bed, wireless internet, satellite TV, bathroom and a mini refrigerator. While at GPSTC, students have access to a full gym and remodeled weight room, game room, ATM, and laundry facilities. To make the most of your stay in the GPSTC dorms, you should bring an alarm clock and toiletries. GPSTC provides standard pillows, linens and towels. Phones are no longer available in the dorm rooms. Emergency phones are located on each floor. Lockers are provided for personal items and valuables. Dorm check-in is available beginning at 2:00 p.m. on Sundays, with a check-out time of 8:00 a.m. on the day of departure. All personal belongings must be secured in the wardrobe provided, unless the student is physically present in the room. Students in classes longer than one week must lock up personal belongings in the wardrobe provided, or take them home over the weekend. Quiet hours are enforced from 10:00 p.m. until 6:00 a.m.